advantages in thinness, lightness and facilitates the(or eases) production. There are two type of cover lens: glass and plastic. 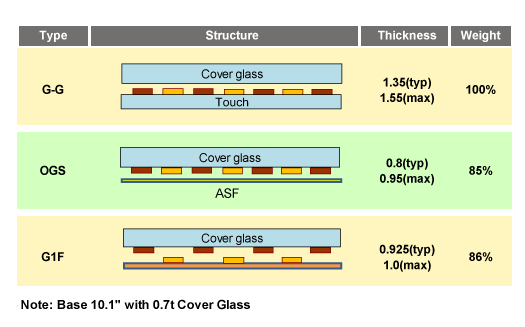 Typical cover lens thickness varies from 0.55, 0.75, or 1.1 mm for mobile devices, up to 3 mm or even thicker for industrial applications. half the thickness of glass to achieve the same performance. Glass only. 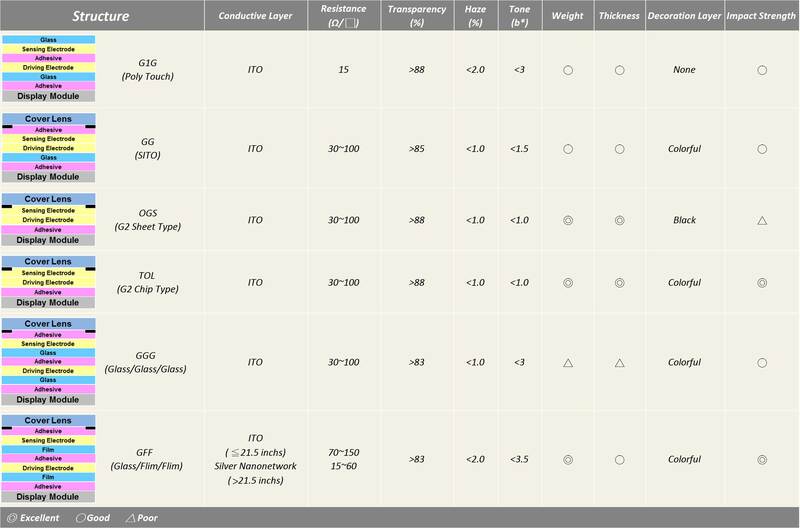 The followings are our available capacitive touch panel structures. standardized or customized and be integrated as part of the LCD module. The cover glass is used to protect the sensor glass underneath, and the sensor glass is used to sense the touch points. 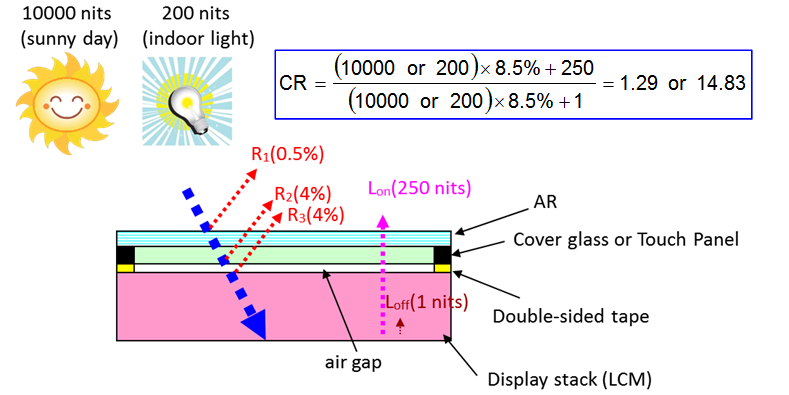 The sensor glass is coated with two conductive layers of ITO: one for the x-axis, another for the y-axis. There are two types of G/G solutions: double-sided indium-tin oxide (DITO), patented by Apple, and single-sided ITO (SITO) that is the most popular used in the CTP industry. The overall thickness of EDT’s G/G type CTP can be from 1.1 mm for portable device to 3.5 mm or even thicker for various industrial applications. Advantage for G/G type CTP is that the glass cover lens can be custom made by screen-printed on the rear surface, in-mold decorated (IMD), complex treatment with multiple holes and slots, rounded corners, even bent edges, and in most cases, chemically strengthen to enhance its resistance to external impact. layout. Once circuitry is completed, mother glass is then divided into individual size panels, and applied with edge-grinding treatment. A second step of chemical strengthening process is then applied, followed by optional decoration printing or surface treatment. cover lens and blackmasking (BM) process, followed by circuitry application and at last any pattern decoration or surface treatment. film sensor. 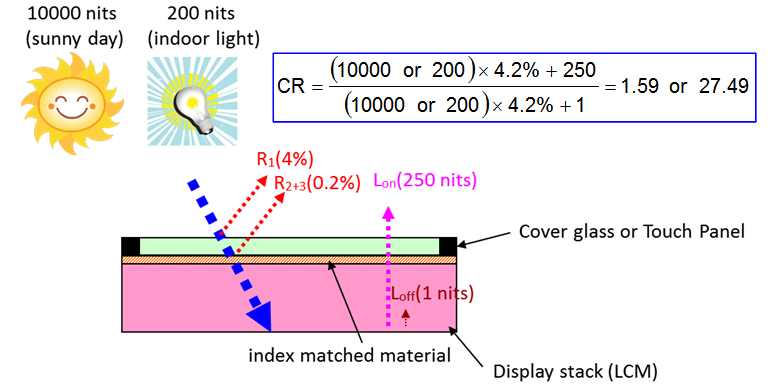 G1F improves thickness and weight of G-G, and also the optical performance of G-F-F.
material such as OCA (Optically Clear Adhesive) or OCR (Optically Clear Resin) between the layers to completely fill the air gap. displays, and ATM equipment, for clear visibility under sunlight or in bright environment. and heater glasses, touch screens, and UV, EMI, and sunlight filters. larger than the structure without AR. cone, making these undesirable reflected images and glare blurred to the eye. one standard types of AG coating, both with superior glare reduction for glass cover lens. 1. The transmission rate could reach up to 92% for single side one layer AR coating and 94% for double side two layers AR coating. 2. AR coating is vulnerable against finger prints, therefore extra layer of AF costing is always required.